There are so many great appetizers out there, yet so few are available as a Keto dish. Some of my favorite “Bar Foods” from the past are Loaded Potato Skins and Jalapeño Poppers, we’re talking early 2000’s TGIFridays and Applebee’s. I don’t really go to those places anymore, in fact I’m not really sure how many people still do, or if there are any of either of them around my neighborhood. But I still get those cravings every now and then for something like that. Since we can’t have potatoes, that ruled the Loaded Potato Skins out of the equation so I was on a quest to make some Jalapeño Poppers. I was originally looking to bread them in coconut flour and then deep fry them, but then I opted to put a little twist on them. 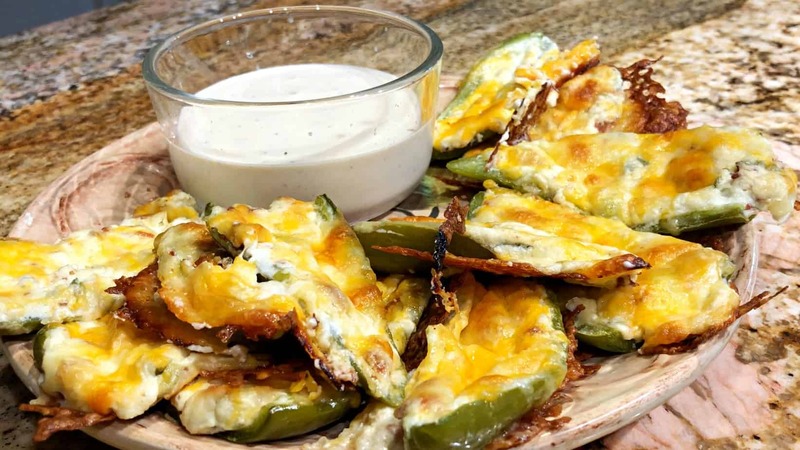 What if I took some of the ingredients and cooking methods from the Potato Skins and integrated them in with the Jalapeño Popper recipe and then baked them? And that’s what we did. I will caution, that you do not want to over cook these in the oven, or else you might risk you jalapeños going limp on you. I’d also still really like to try these coated in the coconut flour and fried too! Place Softened Cream Cheese into a medium mixing bowl, and add in the Sour Cream, Sliced Green Onion, and Bacon Pieces. Mix with a hand mixer until thoroughly blended. Wash the Jalapeños, and then cut off the tops, cut them in half down the middle, and remove the seeds and fleshy sections from the middle of the peppers. Using a spatula of a spoon scoop out some of the Cream Cheese mixture and fill the jalapeños up. After the Jalapeños are frozen, pre-heat the oven to 400*F.
Place the Jalapeños onto a baking sheet lined with parchment paper, and top them with either Cheddar Cheese, or your preferred Shredded Cheese Blend. Taste great but I prefer to wrap my bacon around the popper.